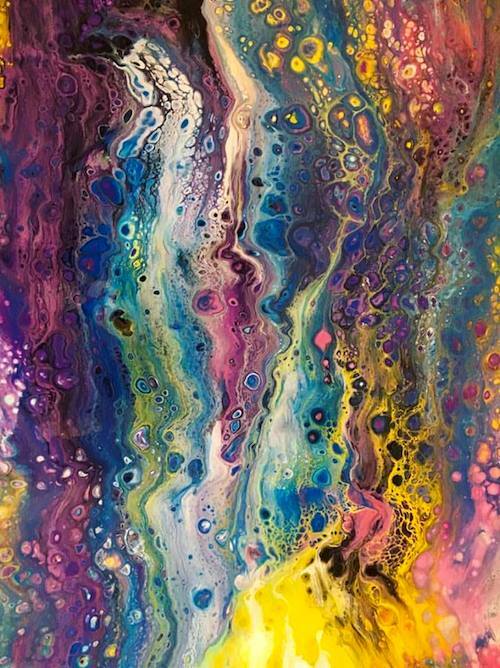 The Trend of Poured, Fluid, Oh-So Floooooowwwwwy Paint. You've seen them all over your social media, Etsy, and even maybe your smartphone commercials- swirls of moving color in liquid, dancing together but not quite blending in a beautiful dance of free artistic expression only governed by the tilt of the surface and the density of the pigments, with a little help of the oh-so-skilled person handling the colors... or does it really take that much skill? No, it does not take much of anything to start into pouring paint. Because you literally pour paint. pour it in cups, pour it on canvas/wood/records, what-have-you. No, if you want them to look like everyone else's pieces. No, if you want to play around and have a fun weekend project. No, if you want to teach workshops a la Paint-and-Sip. 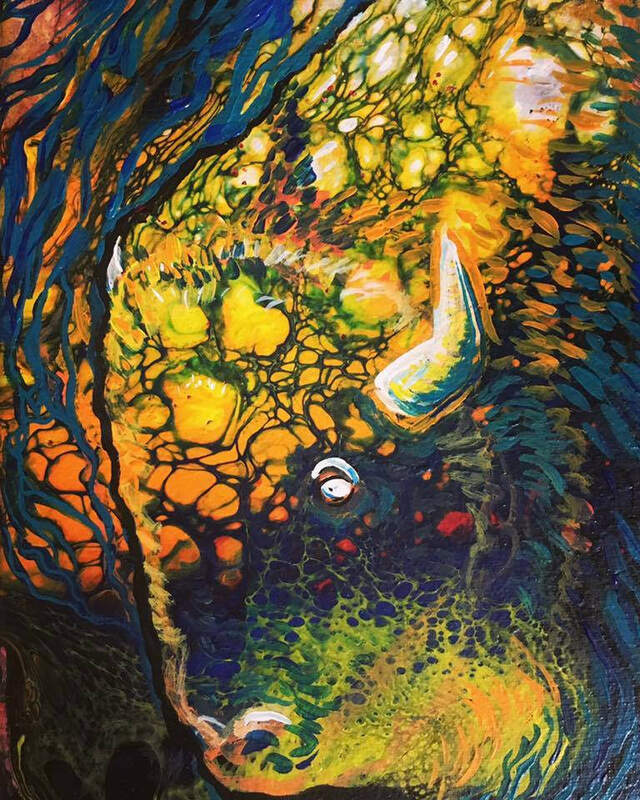 Are you an artist who is just getting into poured paintings and wants to stand out from the crowd? Facebook has a group for poured painting artists, with over 15,000 members. Youtube has about 23,900 results for "poured acrylic painting" videos. Based on this, how will YOU stand out? Here is the part where I tell you I am doing poured painting too! Yes, I fell hard for this trend. Very hard. It's all over my Instagram. Also... honestly I'm *not* one of the good ones when it comes to pouring alone. I have to try to find my own special way to stand out if I want to incorporate it into my sellable works. The reason I originally took up the tempting technique was the same reason anyone takes up a hobby and the same reason I took up art as a child- it's fun! As someone with my bundle of brain-issues, it is so calming and peaceful, and surprising and exciting at the same time. When I spend many days with detailed drawings, it helps me loosen up, or helps me warm up to working with larger brushstrokes (though it does take up a lot of studio space!). I have seen beautiful pours worked into furniture pieces, modern accessories, even incorporate fine materials like gold and precious stones, and I have seen pours used as a background for more representational artwork. They have been made into coasters, jewelry, and coated glasses, trays, bottles, vases, and other items. 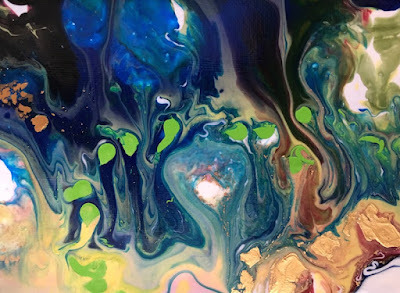 Some great resources for learning poured painting include groups on Facebook like this one, or channels on Youtube like this one. Neither of these links are mine, they are just great resources with good posts about starting on a budget (even with supplies from the dollar store! ), with a few clues to get one where they are going when they are ready to get serious about it too.